Apakah kelebihan penguatkuasaan kesalahan lalulintas melalui AES berbanding kaedah sedia ada? Apakah AES berkesan dalam mengurangkan kadar kemalangan jalanraya? Jikalau AES begitu efektif, tidakkah sistem ini tidak lagi diperlukan pada masa hadapan? Agensi manakah yang akan bertanggungjawab terhadap pelaksanaan AES? Apakah peranan PDRM di dalam AES? Apakah asas penentuan lokasi pemasangan kamera? Berapa bilangan kamera yang akan dipasang? Adakah rakyat akan marah dengan tindakan kerajaan melaksanakan AES? SEPANG: The Automated Enforcement System (AES) is fair to responsible road users, Transport Minister Datuk Seri Kong Cho Ha said. He urged opinion leaders to not jeopardise the safety of road users by turning the issue into a political one. The system has been a subject of heavy criticism since its launch on Sept 22 which saw the operation of 14 cameras nationwide. “I don't think anyone would object to something that will improve roadsafety and reduce deaths due to accidents. “Every year, over 6,800 people died on the road in our country in over 400,000 accidents. What about the tens of thousands who were injured?” said Kong when asked to comment on the purported objections raised against the implementation of the system. He said the AES was not a project that was rolled out in haste but wasplanned in detailed, as it was debated and answered in Parliament for several years'. “When accidents happen, they question why we do not do enough. But when we do something which is proven (to be effective), they also want to play politics, which is very unfair to responsible road users. “I hope this will not be politicised to risk the life of responsible road users,” said Kong. 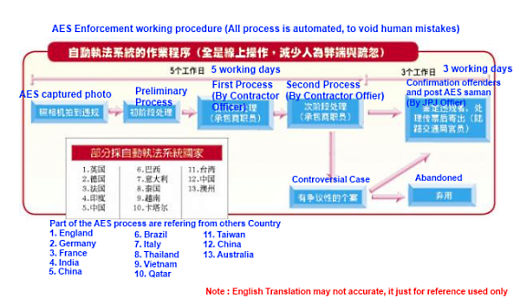 IS it me, or is there anyone else who feels that the whole protest about the implementation of the Automated Enforcement System (AES) just does not add up? Incidentally, the camera-based traffic monitoring system is being criticised not for what it is expected to do, but because of the companies operating it, allegedly cronies and thus justifiably to be given the whole political treatment by the federal opposition. With elections around the corner, four Pakatan Rakyat-controlled states have decided not to go ahead with the AES. This is understandable if one is burnishing one's populist credentials -- cronies making money from the poor taxpayers, surely this cannot be allowed! KUALA LUMPUR, Oct 31 ― A PAS lawmaker today urged road users not to pay off traffic summonses issued under the federal government’s controversial Automated Enforcement System (AES), saying that they should claim trial to the offences instead. “Now I want to ask, if the government refuses to delay the implementation of the AES and withdraw all summonses issued, everyone who receives the AES summonses don’t need to pay the RM300 compound, instead follow this instruction to go to court...” PAS vice-president Datuk Mahfuz Omar said at a press conference today. He said that Pakatan Rakyat (PR) was prepared to provide lawyers to represent those who chose to contest the summonses in court. Yesterday, PR said it would suspend approval for the AES’s implementation in the four states of Penang, Selangor, Kedah and Kelantan, to allow for further discussion and public feedback. Penang Chief Minister Lim Guan Eng yesterday said that PR’s move would mean that 331 out of the planned 831 cameras under the nationwide AES scheme will not be installed. The AES cameras, which detects speeding motorists and those who beat traffic lights, is in its pilot phase, with 14 installed in Perak, Kuala Lumpur, Selangor and Putrajaya. Today, Umno MP Datuk Bung Mokhtar Radin also crossed the political divide today and backed the opposition PR pact in calling for Putrajaya to suspend enforcing the controversial traffic system, saying it could be used as electoral fodder against the ruling Barisan Nasional (BN). Several influential non-government organisations including the umbrella body representing civil servants, CUEPACS, have also opposed the enforcement by saying the system is not currently suitable. They also want the government to review the locations where the AES would operate. However, Bung Mokhtar was reported to have said that the system was necessary to “discipline” road users for the good of all. Lawmakers previously argued that the AES would only benefit the two companies running the system ― Beta Tegap and ATES ― as the firms will allegedly stand to earn RM16 from each summons issued by the AES. 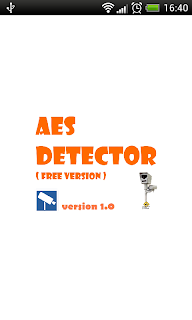 AES Detector version 1.0.7 coming soon. New version of AES Detector v1.0.7 is just around the corner, stay tune for the updates. Now, it can detects the AES camera up to 2km (speed camera). There's lot more features will be added in soon. KUALA LUMPUR: Umno Youth wants the Government to defer implementation of the Automatic Enforcement System (AES). "It isn't that we are not in favour of the AES; in fact, we fully support it as it can discipline road users. We only want to ensure that the people would not be encumbered by the weaknesses if it is implemented now," he told reporters after chairing Umno Youth's executive committee meeting at Putra World Trade Centre here Tuesday. Khairy said the Government should also organise campaigns to educate the public on the necessity of the system. "It is important that the public understand the system clearly as it can save their lives, besides preventing the Opposition from playing with the issue to frighten the people," he said. In Kangar, Perlis Mentri Besar Datuk Seri Dr Md Isa Sabu also urged the Government to provide a clear explanation to the people on the AES to make them understand that it was to ensure drivers were disciplined while on the roads. According to news reports, all four Pakatan Rakyat-led states have deferred the implementation of the Automated Enforcement System (AES) until further discussions and consultation have been carried out. The state governments wanted more details on the AES, Penang Chief Minister Lim Guan Eng said. “We decided to defer its implementation in Pakatan-led states to allow further consultation and engagement,” he told reporters. He added that the states were not against the AES, but wanted to ensure that motorists were not unnecessarily penalised by the system. The decision will affect the installation of 331 cameras out of the 831 cameras nationwide. Set to be deployed in stages, all the cameras will be up and running in 18 months from now. Already, 14 AES cameras have been operational since September 23. In Selangor, there are a total of 112 speed trap cameras and 28 traffic light cameras scheduled to be installed, while Penang is set to deploy 39 and 18 units respectively. A total of 69 speed trap and 26 traffic light cameras will be implemented in Kedah, while Kelantan is set to install 28 speed trap and 12 traffic light cameras respectively. 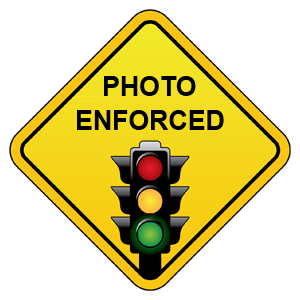 KUALA LUMPUR: The opposition-administered states ofPenang, Kedah, Kelantan and Selangor have agreed to postpone installation of theAutomatic Enforcement System (AES) cameras to nab motorists who speed and runthe red light, Penang Chief Minister Lim Guan Eng said today. He said representatives from the states would meet Transport Ministrysecretary-general Datuk Long See Wool next month to obtain more information on the AES, including the cost and the operating companies. Some 331 AES cameras were to have been installed in the four states, but theimplementation of the system would be postponed, he told a news conference atthe lobby of Parliament House, here. KUALA LUMPUR, Oct 29 ― All four Pakatan Rakyat (PR)-governed states have decided to suspend the federal government’s controversial Automated Enforcement System (AES) that detects speeding motorists. “That means 40 per cent will not be installed,” Penang Chief Minister Lim Guan Eng said at a press conference today, referring to the 331 out of the planned 831 cameras under the nationwide AES scheme. The AES cameras, which also captures those who beat traffic lights, is in its pilot phase, with 14 installed in Perak, Kuala Lumpur, Selangor and Putrajaya. Following Election 2008, PR now governs Penang, Selangor, Kedah and Kelantan. Lim said approval from state administrations was needed for the project initiated by the federal government. The state authorities will withhold approval for the installation of AES cameras until they receive more information, he added. He also said the PR states also wished to obtain the public’s feedback on the camera system first. “(It’s) not that we want to encourage the committing of offence as we please, but do it correctly, do it well,” Lim said. Sunday evening, spending time go through again the AES camera location and i found out that the latest data is different from the previous published version. (Kajang, 27), the Malaysian Institute for Highway Safety (MIROS) Director Professor Dr. Wong Shaw Voon stressed, the driver should not be regarded as a kind of "enjoy" and "entertainment", driving originally should have a certain amount of pressure, the driver will be at any time vigilance. "In the car on the road, as long as a mistake, not only let yourself losing your life will incriminate innocent 'funerary' drivers should be responsible for their own and other people's lives." AES can cut down on road deaths, says expert. SHAH ALAM: An expert in intelligent transport systems, who studied the effectiveness of the Automated Enforcement System (AES), says speed cameras can reduce the road fatality rate at killer stretches by at least 35%. Universiti Teknologi Mara Surveying Science and Geomatics Department lecturer Dr Khoiri Mohd Dimyati, who has almost 30 years’ experience in public transportation and enforcement systems, said speed cameras in other countries were already successful in reducing road fatalities by enhancing the perception of motorists that they would be booked for speeding. He said studies in countries using AES showed that the system succeeded in reducing accidents and related deaths by as much as 70%. “I believe AES can reduce our road fatalities by 30% to 35%. If the AES can work in other countries, it can work here too,” he said in an interview. AES cameras zooming at the wrong spot? KUCHING: A proper study to determine the best locations for Automated Enforcement System (AES) cameras must be done soon to prevent traffic chaos. Wanita PKR vice chief Voon Shiak Ni claimed that AES cameras erected after the Mile 9 traffic light near here had frustrated many motorists due to its ‘inappropriate location’. “The AES camera is not suitable because there are no schools and pedestrians paths in that area,” she told a press conference at PKR Stampin office yesterday. “We call on the government to make a proper study of the locations and to give priority to areas with schools nearby and accident prone areas,” she suggested. Voon also called for a review of the RM300 summon imposed for speeding, adding that not many people could afford the amount. She was also anxious to know if considerations were given to those in an emergency. We just started our side verification process to verify the location of the camera. Thanks to our AES Detector Volunteers Team Member. If you have the detect the actual AES camera location via AES Detector, kindly screen capture screen from your mobile phone and email me at chuasw23@gmail.com. You contribution is highly appreciated. After accumulate all of our users idea/feedback, version 1.0.6 was released mainly to fix some of the user request. 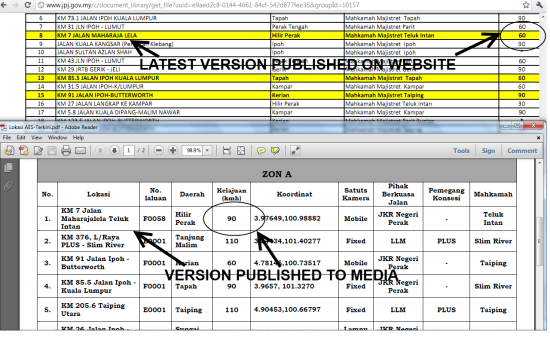 The most important is location KM 376, L/Raya PLUS - Slim River was verified this morning and already included the latest GPS point in this version. - Showing beep alert every 30 second when running in background (userful for Papago and Waze User). This screenshot layout is taken from HTC Desire HD - ICS Custom ROM. Note : Remember to check update via play store in order to get this new layout. 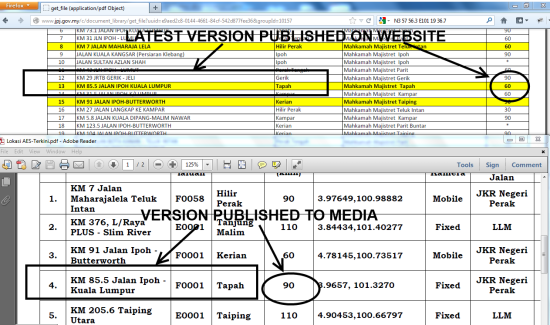 JPJ website just upload latest AES Loctaion (without GPS point). Adalah dimaklumkan bahawa senarai lokasi yang dinyatakan disini adalah merupakan cadangan lokasi pemasangan kamera AES. Penetapan setiap lokasi yang akan dipasang dengan kamera adalah tertakluk kepada hasil pemeriksaan lokasi bagi mengesahkan lokasi yang dicadangkan (sites verification) sebelum diluluskan pemasangan kamera oleh pihak JPJ. Pemeriksaan dan pengesahan lokasi akan dilakukan oleh pasukan petugas AES yang diketuai oleh JPJ. Bagi mengelakkan kekeliruan dikalangan orang ramai, JPJ telah mengeluarkan maklumat berkenaan dengan kordinat lokasi. Walaubagaimanapun, kordinat ini akan dimasukkan semula setelah pemeriksaan dan pengesahan akhir dilakukan oleh pasukan petugas AES sebelum pemasangan kamera dilakukan dilokasi. Cadangan Lokasi Penguatkuasaan Kamera AES Bagi Mengesan Kesalahan Memandu Melebihi Had Laju DiTetapkan Bagi Region A.
Cadangan Lokasi Penguatkuasaan Kamera AES Bagi Mengesan Kesalahan Tidak Mematuhi Peraturan Lampu Isyarat Bagi Region A.
Cadangan Lokasi Penguatkuasaan Kamera AES Bagi Mengesan Kesalahan Tidak Mematuhi Peraturan Lampu Isyarat Bagi Region B. 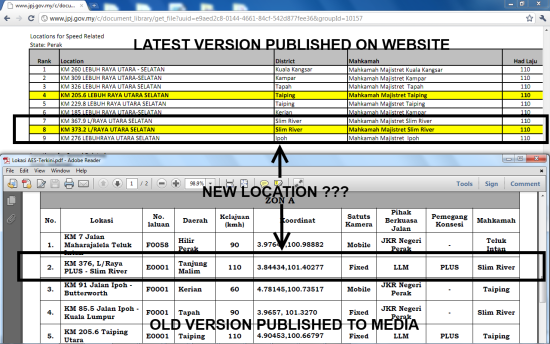 Urgently need Slim River GPS Point !! 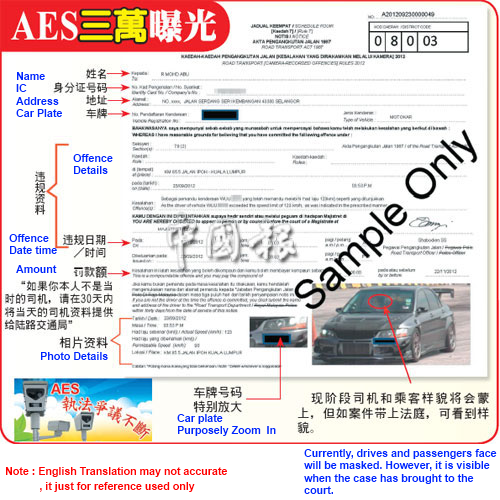 I would like to apologies for a case happened to our user who just received his AES summons. Please be carefully when u passby this point KM 376, L/Raya PLUS - Slim River. Slow down your car when AES alert you from 1km away. 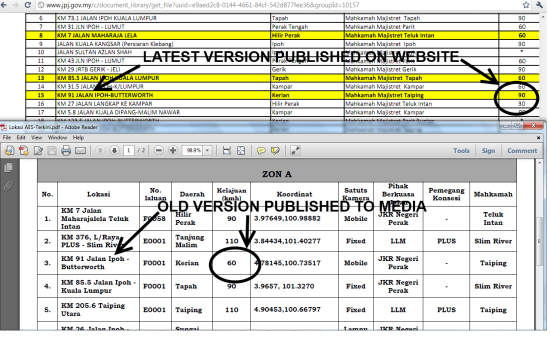 Besides, hope you can print screen the correct GPS point, so that i can amend it into AES Detector database. Hari jumaat 26 Oct 2012 Hari Raya Haji telah pun tiba. 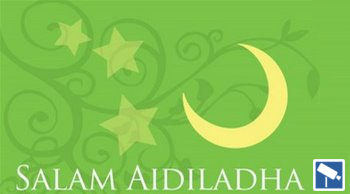 Kepada semua kawan-kawan muslim, selamat menyambut Hari Raya Haji 2012 ! Dalam 3 hari cuti yang panjang ni, saya rasa ramai yang akan balik kampung. 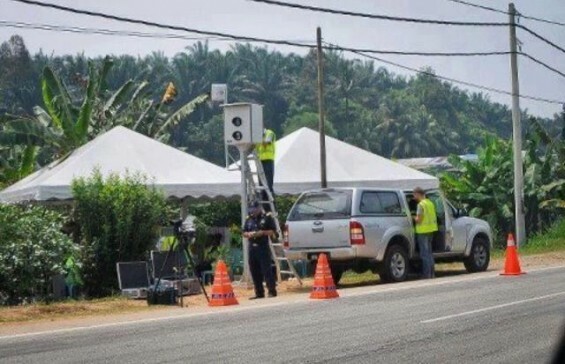 Untuk siapa-siapa yang menggunakan PLUS NORTH-SOUTH highway, jangan lupa membuka AES Detector untuk mengingatkan kamu camera tu. Jangan-jangan kena terbayar pula. Di sini juga saya ingin mengambil kesempatan untuk mengucapkan ribuan terima kasih atas sokongan dan candangan anda kepada AES Detector. Semoga applikasi dapat dilanjutkan lagi untuk membantu anda untuk mengesan kamera AES dengan lebih tepat. AES Detector versi 1.0.5 sudah dalam pembangunan, harap-harap dapat dilancarkan selepas cuti ini. Why AES Detector didn't alert you ? Base on the feedback posted in the review, we found that some users failed to detect AES camera or cannot hear any alert sound when bypass the AES Camera. 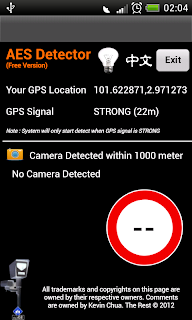 Please check your GPS signal status on AES Detector. You need to make sure your GPS Status is showing "STRONG" on the screen. 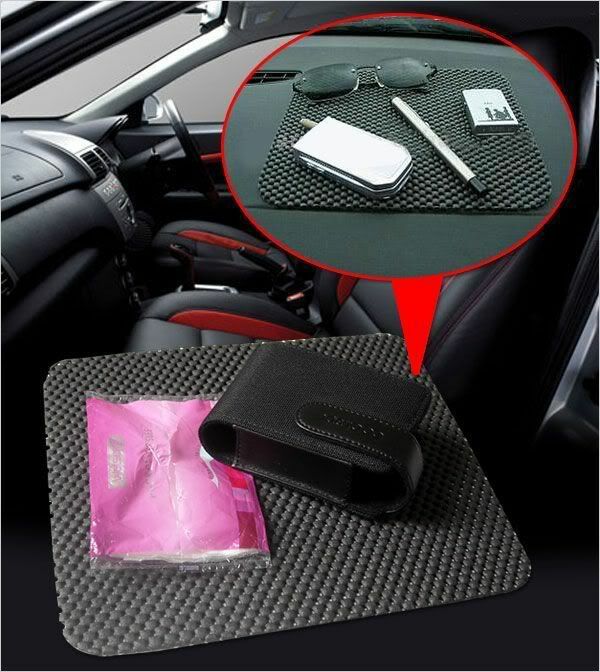 Buy an Anti Slip Mat and place your phone face up the wind screen. 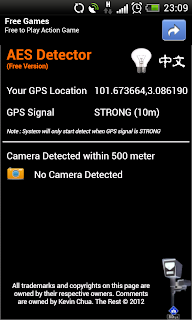 You should able to locate our GPS signal within few seconds. Hope this can solve your issue. Appreciate and thanks for your support on AES Dectector. Range inflexibility & other suggestions Suggest to include range selection options for flexibility, instead of sticking on 500m. some people may have different preferences on the range distance. Other suggestions = Let's say I have driven to the exact spot of the AES camera as what have been pin-pointed by your APP, you may code the APP to pop-up a question for us to pick answers such as "ACCURATE SPOT", "INACCURATE SPOT" or "NON-EXISTENT AES" in order to auto gather information for you to further improve your APP through periodical updates to fix those issues. 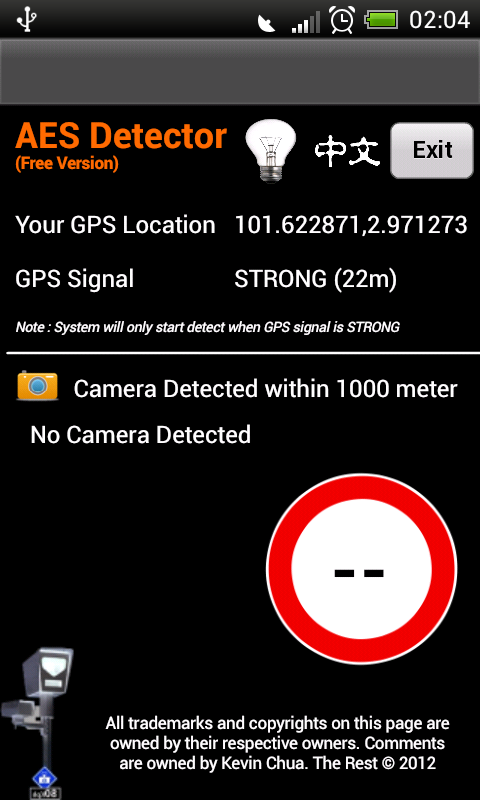 Add-on = If user selected "ACCURATE SPOT", the APP should run the Camera app on the spot for the user to snapshot the picture of the AES camera for verification purpose to avoid fake information submitted to you. I'm sure you'll understand what I mean, I believe you can come up with better ideas by being aware of my rough ideas. I fully support the development of this APP to be improved from time to time. Good attempt Good attempt! And it works. There's an AES camera located on the highway that I drive to work every morning, and this app detected it (with my phone GPS turned on). I believe the app has all the AES coordinates released by JPJ last month, hence when you are approaching one, it will trigger an alert. My only two suggestions: (1) Increase the range from 500m to at least 1km (or 1.5km is even better). This will give motorists more time to slow down esp if they are driving fast. 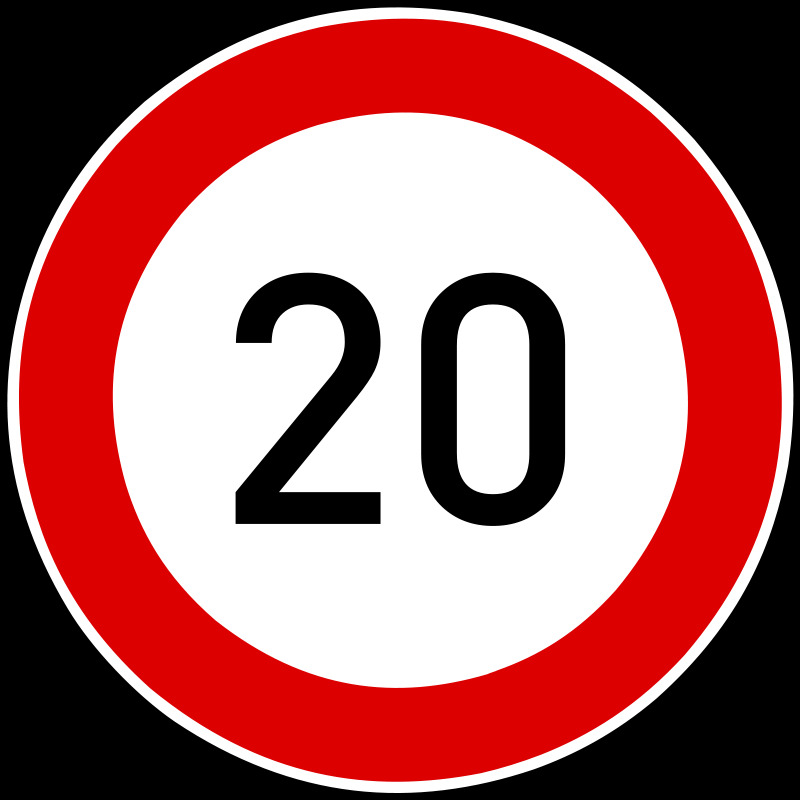 (2) If possible, put the speed limit into the alert announcement as well. This will let motorists know what speed limit they should be driving at. Nonetheless, it is a good app. Thank you very much. Request on range expansion Hi, glad that you came up with this great idea. I'm not sure it's whether working or not till I try it out real soon. However, it will be great if you increase the range from 500m to 1km or 1.5km in order to alert the user. This will greatly reduce the possibility for the "OMG! It's too late!" cases. Thanks. 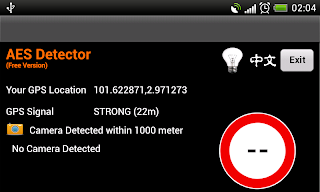 ahGee wonder if the detection range can be increase to 1000m. Detect it, you are safe. How to use AES Detector ? 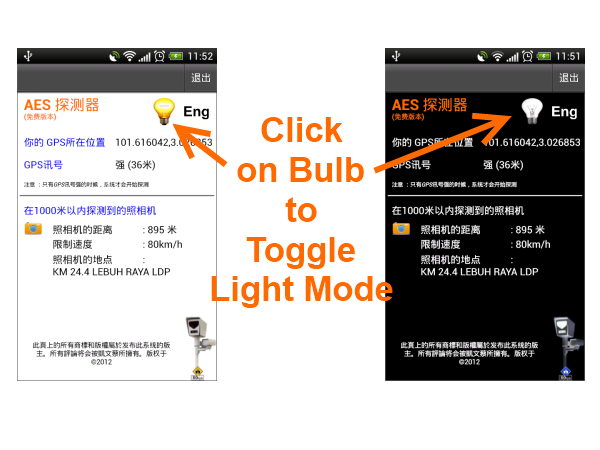 Once your double click to launch AES Detector from your phone, application will start the detection job automatically. 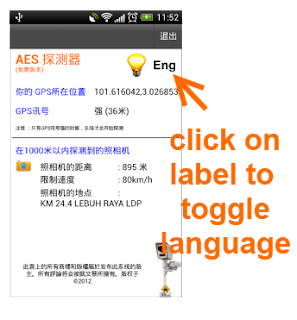 There is only 1 criteria required by AES Detector is must turn on GPS. 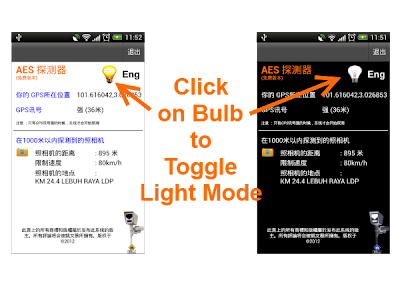 AES Detector is a mobile application to detect then the new launching AES Camera in Malaysia. System will auto trigger alert sound to remind you when detected any AES Camera within 1000 meter from your driving point. Make sure you turn on your mobile phone speaker in order to hear the alert sound. From the source reported earlier that the full complement of 831 Automated Enforcement System (AES) cameras will be up and running in 18 months from now, with the cams set to be deployed in stages. Already, 14 AES cameras have been operational since September 23, and these are installed at various hotspots or accident prone areas in the Klang Valley and Perak. KUALA LUMPUR, Oct 18 − Putrajaya has refused to pander to demands raised by federal lawmakers across the political divide to temporarily shelve the Automated Enforcement System (AES) despite concerns raised over its ability to reduce road accidents by punishing speedsters. Transport Minister Datuk Seri Kong Cho Ha told reporters in Parliament today that the government is firm in implementing the system according to schedule, insisting that it would benefit road users in the long term. KUALA LUMPUR: There is no restriction in the use of detection devices by motorists to beat the Automated Enforcement System (AES), said Deputy Transport Minister Datuk Abdul Rahim Bakri. "We cannot stop anyone from using gadgets to beat the AES. "That is why the system is transparent and there is no restriction on the use of detection devices," he said when answering a question raised by Tan Sri Shahrir Abdul Samad (BN-Johor Bahru) when winding up the budget speech for his ministry Wednesday. He noted the transparency of the AES system was evident as the locations of the camera were made known to the public. "The system (AES) is transparent as the locations of the cameras are known and available on the website for those interested to know. "There are even warning signs put up two-to-three kilometers before the cameras locations," he said, adding that the mobile phones GPS systems would be able to determine the location of the cameras.